Darren Criss gets his dream role on a TV show called Glee, but when he meets his co-star Chris Colfer, everything changes. For better or for worst? He won't know. The only thing that is for sure, is that his new man will turn his world upside down. Everything that he thinks he knows, will be challenged. It all begins when Chris decides to play a prank on the unsuspecting netizens of the CRISSCOLFER fandom with Darren none the wiser and it all snowballs into a huge riot… and a coming out? RPF. AU. Cross-posting from FFNet. A various collection of my Crisscolfer drabbles and headcanons. Most of them would be too short to post them seperately, so I´m gonna put them all in one post. Darren participates in The Land Of Stories voting! When Darren Criss meets his new lover at a private lesson with 49 other fans what will happen? When Chris Colfer hands his friend Darren Criss a copy of his book, they have no idea they`re about to enter a land beyond all imagining: the Land of Stories, where fairy tales are real. Follow the friends` unexpected journey through the magical land. Joey and Sydney act just alike. This is a muti-part story. Darren and Chris have been dating for a while and Darren gets called to do Broadway. Darren is off to New York leaving Chris in LA. Then tragedy stikes. What will happen to Darren's Broadway dreams in the face of this tragedy? Wow! The story is not as tragic as I just made it sound. 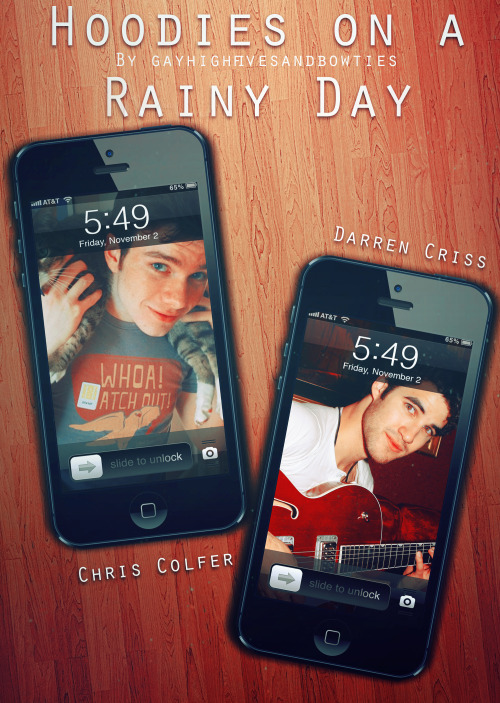 I do not own anything just love to write about Chris and Darren! Hope you like it! The Winter is beginning and both Chris and Darren get up to go to the studio for rehearsals- together. Remember: Anything could happen, especially when you least expect it.